Current Status: in Grand Lodge Vault; merged into St. Paul's-Algonquin Lodge, 06/24/2004. Joseph R. Zottoli, 1947; PDDGM; deceased? Early in 1924, a small group of Masons, members of various Lodges under the jurisdiction of the Grand Lodge of Massachusetts, considered the question of asking for a dispensation to form a Lodge to be composed largely of men of Italian birth or descent. There had been in Boston a Lodge formed about 1908 under the name of "Lunigiana Lodge", which was later changed to "Hesperia Magna", they having received a charter from the Grand Orient of Italy. This charter, however, was recalled late in 1923, principally to permit this group to make application in regular form to receive the degrees in a duly recognized Lodge under the jurisdiction of the Grand Lodge of Massachusetts. The Hesperia Magna Lodge was regarded a clandestine Lodge. Brother Nichols P. Vigilante was the last presiding Master of Hesperia Magna Lodge, and some of the members of that Lodge sought the services of Brother Joseph T. Zottoli and other members of the Craft of the Massachusetts jurisdiction, in an endeavor to form a Lodge in the City of Boston, to be composed primarily of men of Italian descent. Acting upon the recommendation of Most Worshipful Melvin M. Johnson, Past Grand Master, and Right Worshipful Frederick W. Hamilton, Grand Secretary, it was decided to organize a Lodge under the Grand Lodge of Massachusetts and allow the members of Hesperia Magna Lodge, that had been under the Grand Orient of Italy, to make application for the degrees in the new Lodge as individuals, if they desired to make the request in regular form. Under the Constitution at that time, is was necessary to obtain the consent of 26 of the 39 Lodges then meeting in the City of Boston, which required several months' time and effort. The first organization meeting was held on February 20, 1925, and two others were held later. Right Worshipful Harry E. Perkins, Past District Deputy Grand Master of the 10th Masonic District, was chosen as the First Master, and he arranged much of the detail including the services of Worshipful Brother William W. Chute to act as Senior Warden, Worshipful Brother Albert H. Lamson as Secretary, and Reverend Brother Charles E. Eaton as Chaplain. Arrangements were made to meet in the Masonic Apartments, 372 Broadway, South Boston. The Most Worshipful Dudley H. Ferrell, Grand Master, granted the dispensation which was signed on May 20, 1925 by 39 Master Masons, for the institution of Hesperia Lodge, and on June 16, 1925 Right Worshipful Herbert S. Locke, District Deputy Grand Master of the 4th Masonic District, assisted by Worshipful Stephen F. Gardner, Acting District Deputy Grand Marshal installed the first officers of Hesperia Lodge, and thereafter declared Hesperia Lodge A. F. & A. M. under the jurisdiction of the Grand Lodge of Massachusetts, to be duly and regularly instituted. The aprons, jewels, working tools and other paraphernalia were most generously given, not only by charter members of the new Lodge, but also by individuals and the Masonic Bodies meeting in the same apartments. Brother Nichols P. Vigilante was the first candidate elected to receive the degrees in Hesperia Lodge, and was received on the First Degree on July 21, 1925 by the Worshipful Master. 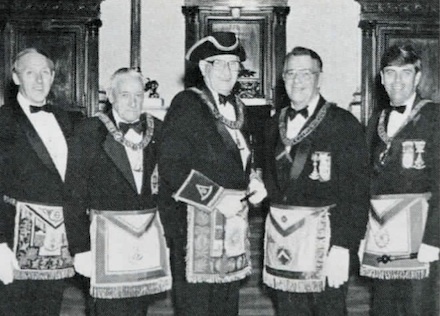 The first candidate to receive the Master Mason Degree was Brother Rocco Brindisi who was raised by Right Worshipful Walter F. Johnson on November 17, 1925 and signed the By-Laws on June 15, 1926. Between Institution and Constitution, 36 applications were received, 28 of the applicants were elected to receive the degrees, and 20 were raised to the degree of Master Mason. Three of the applicants were elected after the Lodge was Constituted and 5 requests for release of jurisdiction were refused. There were 31 petitioners for the Charter, 29 of whom completed their membership by signing the By-Laws. Worshipful Brother Guy A. Ham, one of the petitioners, who was deeply interested in the forming of the new Lodge, died May 23, 1926. The first name in the By-Laws of Hesperia Lodge is that of Brother Joseph T. Zottoli, who since its inception, had worked with enthusiasm and loyalty to procure a dispensation for Hesperia Lodge in order that men of Italian birth or parentage might have an opportunity to embrace the privileges of Masonry, that in many cases had been denied them, although worthy and well qualified. This honor was accorded him on account of his zealous work in a splendid cause, his great interest in Masonry which still continues, and in order that he might be looked upon in a great measure as the "Father of Hesperia Lodge." At the time of its inception in September 1925, Hesperia Lodge held its meetings in the Masonic Apartments in South Boston. They continued in South Boston up to November 1928, at which time Hesperia moved to the Masonic Temple in Boston. The first meeting in December 1928 was held in Sodality Hall No. 4. On January 1929 Hesperia met in Corinthian Hall, where it continued to hold its meetings to this date. The history of Hesperia Lodge is not unlike that of many Lodges, yet, to us it is rich with the deeds and sacrifices of men of noble heart. This Lodge has been the door through which many lives have been brightened, enriched and inspired. It has found our membership alive as one in the common call of fraternity, faith and service. It has made us humble, grateful and proud that so much good in man has found expression in the past to challenge us to strive into the dawn of a new day. This good is of no avail, however, unless it leads our footsteps onward and our hearts upward — ever toward God. History is but the collective life stories of us all. It begins in our hearts, passes into our homes and from there reaches into the life of the Lodge, Church and Community. It is but a composite of the character and characteristics of those we mingle with along the way of life. That is our Fraternity, our Nation, our generation. The past is first biography, then genealogy and finally history, the outcome of human action — first of one man, and then of many. The memory of the past carries with it the hearts and souls of men, their character and conduct, their power and responsibility, their inspiration and encouragement towards finer living, finer thinking, finer manhood. Each of our members has had his part in writing our history, even if their life story has been no more than the humble record of a day's work well done, the unvaunted recognition of virtue, integrity and spirit of sacrifice. Each has shared the glory of our achievements and been mutually concerned with the periods of slow advancement. Yet, now as we reach the pinnacle of this moment — a significant milestone in our existence — we approach it in reverence and humility. We take pride in the love of those who have worked so hard and given so generously that our Lodge might press proudly forward. We rededicate ourselves solemnly to the ideals that have made our Institution strong and enduring — and hope ever to be the medium of implanting Light, Love and Truth into the hearts of whoever may knock at our door! Hesperia Lodge is justly proud of all its members, but 33 family names stand out like Beacon Lights. I will now attempt as quickly as possible to try to give a brief biography concerning each of them. I shall endeavor to do it in alphabetical order. The first is Brother Avellino, who like the disciple of old was not satisfied that he himself was a member of Hesperia, but rather brought into our Lodge his two sons, Brother Sylvio Avellino and Brother Sebastian Avellino. The next is the name of Arcaro, which consists of Brother Joseph, Brother Vincent and their brother-in-law, Brother Fred Aragona. The next is Brother Harold (). Bailey, who brought into our Lodge his son, Brother Henry E. Bailey. Barhanti is the next name. Brother Angela Barbanti brought into our Lodge his son, Brother Richard E. Barbanti. The next family is Borsini. Brother Joseph Borsini, also a quiet unassuming brother yet he brought in his son who became Worshipful Brother Julian E. Borsini, who in turn brought in his son, Joseph Borsini. The name Carbone consisted of Worshipful Brother Nicolo Carbone, his brother Angelo Carbone, who became and was Lodge Treasurer for many, many years. The next name is Donadio. Brother Pasquale (Pat) Donadio, brought his step-brother Santi Calareso and his beloved nephew, Chester A. Donadio, one who has been helpful in planning for this 50th anniversary celebration. The next name is Falcione. Brother Rocco Falcione brought in his two sons, Worshipful Brother Alfred M. Falcione and Worshipful Brother Edward J. Falcione, he also brought in his son-in-law, Worshipful Brother Robert J. Rodocchia and his nephew, Brother Pasquale Falcione. The next name is Farrugia. Worshipful Brother Jerome Farrugia brought in his two sons, Brother Dr. Louis R. Farrugia and Brother Ross P. Farrugia, a young engineer. Gatteny is the next family. Brother George D. Gatteny joined and before long brought in his brother, Louis D. Gatteny. The family name Gechijian is an exceptional bright Beacon Light in Hesperia Lodge. Brother George Gechijian, a humble man of Armenian background with hard work and perseverance became one of the outstanding photographers and founder of the "Harvard Studio," he brought in two sons, both became Masters. Worshipful Brother Arshag Gechijian and Worshipful Brother Haig Gechijian. Before closing on this illustrious family, I want to add that Worshipful Brother Arshag Gechijian was always a person on whom 1 could depend for any kind of assistance during my period of i3 years of service as Secretary of Hesperia Lodge and finally I want you all to know that Worshipful Brother Arshag Gechijian is also one of the outstanding blood donors of Hesperia Lodge. The next name is Grana. Worshipful Brother James Grana brought in his brother, John Grana and his brother-in-law, Brother Frank Naimo and also his other brother-in-law, Worshipful Brother William R. Federico. I want you also to know that Worshipful Brother James Grana is my wife's brother and my step-brother — try to figure that out. And finally, Worshipful Brother James Grana as a retired Boston Firefighter, and a licensed electrician is now a volunteer workman who gives of his time to the Shriners Burns Hospital. Kalliavas is next. Brother Harry Kalliavas brought in his son-in-law, Brother Christom George Larsin. Petrini is next. Domenic Petrini was raised into Hesperia Lodge, shortly after its inception he brought in his son who became Worshipful Brother Francis D. Petrini. The next family is Pierangelo. Brother Philip Pierangelo brought in his son, Brother Dr. Anthony Pierangelo, who for the past 20 years has lived in California and yet he still maintains his membership in his mother Lodge. I might add that the Pierangelo family donated his hospital bed to Hesperia and for many years it was loaned out to our brethren for their family use. Guglietti. Brother Anthony R. Guglietti brought in his brother-in-law Warren J. Jango. Another bright name next presents itself, Iannello. Brother Rosario Iannello, a modest barber in our Fair City, but his Masonry was so deeply imbedded in his heart that he brought in his son who became Right Worshipful Carmello Iannello, his brother Angelo Iannello, his son-in-law, Brother Anthony Correnti, his grandchild, Brother Lawrence Eugene Babb, Jr. and his brother-in-law, Brother Frank Tortorella and in turn he brought in Bernard H. Dunleavy, bis son-in-law. I wish at this time to give you a little background history concerning Brother Frank Tortorella, before passing to the next name. Brother Tortorella was a young Sicilian boy living in Messina, Italy. At that time President Teddy Roosevelt sent the U.S. Navy around the World. When the ship reached Messina, the U.S. Navy decided to organize a Marine Band. Not having enough musicians of their own they went out in the streets of Messina trying to enroll Italian young boys who were musicians to join the U.S. Navy. Brother Tortorella was one of those young men. He made a career and spent 35 years of his life in active duty in his standby retirement naval service. In spite of his active life in the Navy he nevertheless had 11 children, several of whom both sons and daughters joined the Navy and became career men and women in the U.S. Navy service. He was the Tyler of Hesperia for many, many years prior to his demise. It was quite a treat to watch him maneuver his Tyler's sword each year he was installed as Tyler. The next name is Kanavos. Worshipful Brother George Kanavos is an excellent ritualistic, inasmuch as he possesses a fine clear voice that can be heard throughout Corinthian Hall. He brought in his son, Arthur W. Kanavos. I might add that at the time he raised his son Arthur, the Most Worshipful Grand Master, Donald W. Vose, honored us with his presence and graced the East of our Lodge. The name Lazzara. Worshipful Brother Paul A. Lazzara, who also brought in his twin brother, Michael C. Lazzara, they are identical twins and for many years when I was Secretary, I thought my vision was going really bad, because I would see double whenever these brothers were present. The name LoConte. Brother Louis LoConte was a charter member, he later brought in his son, Brother Louis LoConte. Limone is next. Brother Joseph Limone brought in his son, Brother Louis J. Limone. The next name is Mallio. Brother Bartholomeo Mallio brought in his brother, Brother Ralph Mallio. We now come to the name Mollica. Brother Zachary A. Mollica was Master in 1931-32 and he brought in his brother John M. Mollica, an American naturalization retired officer now living in New Hampshire. Next is Morris. Brother Bernard J. Morris brought in his son, Brother Bernard Morris, his other son, Brother Arthur Morris and his son-in-law Michael Bruno. Perito. Brother Louis Perito, at present retired from Paine Furniture store in Boston, was the greatest candidate investigator that Hesperia ever had. He brought in his brother, Brother Michael Perito. Next follows Procopio. Brother Virgilio Procopio was a custom tailor who brought in his son, Brother Louis Dante Procopio. Next is Rosati. Worshipful Brother Thomas A. Rosati brought in his son, Brother Stanley Darvin Roberts Rosati, and it was Worshipful Rosati that donated his time to build a walk-in freezer in the Masonic Home in Charlton. Next is Rozantis. Brother Charles Rozantis brought in his son, Peter Rozantis. Our next name, Santoro. Brother Santoro (your Historian) is Secretary Emeritus. He brought in his brother-in-law, Brother Leo DeModena, his young nephew, Brother Joseph J. Mattina, Jr. and his step-brothers, Brother James M. Grana and Brother John Grana. The next highlight of a name is Tsialas. Worshipful Brother Nicholas Tsialas brought in his two sons, Brother Gregory Tsialas and Brother James Tsialas, also two sons-in-law, Brother Peter Diamond and Brother Nicholas Phillips. Before finishing on this family, I wish to inform the Lodge that Worshipful Brother Nicholas Tsialas has recently undergone a serious operation in the loss of part of his leg and yet he has carried on the arduous duties of Chairman of this, our Golden Anniversary celebration. The next is Tucci. Worshipful Brother Peter Tucci was a charter member. He brought in his son, Worshipful Brother Dr. John H. Tucci and his son, Brother Ralph Tucci. Worshipful Brother Tucci's boyhood is well worth knowing. He studied as a wood sculptor under many Italian Masters. He was finally told that his teachers in Italy were not able to teach him anything more, so he went to study under French Masters. At the time, the Capital of Brazil was about to be built and the authorities arranged a contest for different artists to submit sketches of said layout. His teacher won the prize, and received the commission. He took most of his boy students to South America and worked them very hard. The teacher paid the boys very small wages and finally the teacher's own wife spoke to the boys and warned them that they were being exploited by her husband and that they could strike for more wages. The teacher refused to give them more so they went on strike. In a short time they found themselves in a strange country, penniless and hungry, and each tried to get whatever work they could do to keep from starving. Worshipful Brother Tucci finally worked his way to the United States and he soon was engaged in business as a custom furniture maker; he operated under the name "The Masters Touch". He manufactured and shipped out most all of the American Ambassador's Federal type furniture, and shipped said furniture to the different foreign countries where the Ambassadors lived. He is to be remembered for the beautiful carved plaque that is installed over the fireplace in the Masonic Museum in our Masonic Temple on Tremont Street and another similar carved plaque which is installed over the beautiful fireplace in the Masonic Home in Charlton. Finally we come to the name Zottoli. Right Worshipful Judge Joseph T. Zottoli was a charter member and brought his son, Right Worshipful Joseph R. Zottoli, and also his nephew, Brother Robert A. Zottoli. The names of the Brothers who follow do not include multiple members of a family and yet for some reason or another are worthy of special note. The first is the name of Albo. Brother Joseph Albo is a quiet, unagressive and unassuming brother, and yet we are extremely proud of him. He is our Champion Masonic Blood Donor who over a period of years has donated gallons of his blood for his fellow brethren and members of their family. The next two Brothers, Reverend Brother Peter P. Giacobbe and Brother Frank Sulfaro were both raised in Mazzini Garibaldi Lodge, recognized by the Massachusetts Grand Lodge, affiliated in Hesperia and Brother Sulfaro, who was raised in 1921 has been our first Brother to receive a 50 year membership medal. Brother Arthur Felicani is the printer of the Golden Anniversary program and son of a very famous man, Aldino Felicani, who fought 6 long years in the famous Sacco-Vanzetti case. Brother Albert B. Fitzpatrick, Korea soldier photographing Unit, and one who has been in the Forest of Lebanon King Solomon's mines. Richard Dell Orfano, Past Master of the Winthrop Lodge and as an affiliate Past Master of Hesperia Lodge and again in the Hesperia officers's line as Marshal. Harry Philip Edwards, as an affiliate; We are proud to have him as Past Master of Hesperia — and again in the Hesperia officer's line as Junior Warden, and if that isn't enough — he is Junior Deacon in St. John's Lodge and a proxy for Army Lodge, Balboa, Canal Zone. And now for a few words for a Beloved Master: Worshipful Charles N. Najjar, who did not live long enough to become a Past Master. Worshipful Brother Najjar departed from our midst very suddenly. Although he was fully aware of his poor health, he carried on the heavy duties of leadership and Master until his untimely death. He was a man amongst men and truly "a little Giant." And finally, the one whom I purposely omitted to mention while I was making my remarks about Brethren who have served Hesperia twice as Master, he is our present presiding Master, Worshipful Brother Domenic Ruscitti, 1962-1963; 1974-1975. In closing may I say that although this biographical factual history may on first appearance seem long, yet myself and my hard working committee honestly and sincerely feel that we have but scratched the mere surface of all the good that our Beloved Hesperia has accomplished during its existence; its created friendships, its good works, and its charities (within its means) are far too numerous to be specifically recorded. Suffice to say that Hesperia Lodge has in the 50 years just past, and will in the future yet to come, continue to prove the worth of its existence. May there be many, many more returns of these anniversary celebrations. In order to assure our Beloved Lodge our Heartfelt Wish as to her future, let its entire membership rededicate our lives anew in order that with Brotherly unison, we may strive to make the "Hesperia Fraternal Star" brighter and brighter, so that no man who per chance comes within the vicinity of her path, need want for "Fraternal Light". The 60th Anniversary of Hesperia Lodge, Boston, was celebrated June 17 with an Italian dinner and Family Night. About 100 members and friends enjoyed the meal and the music provided by Mabel Biagini and her accordion. After dinner there was more music by the Lodge organist, Bro. Marvin Eatough, who was joined by Wor. James Grana and his harmonica. The main speaker was M.W. John C. Marden, Past Grand Master of the Grand Lodge of NH, who is the brother of Hesperia's presiding Master, R. W. Edward A. Marden. The Grand Master, M. W. David B. Richardson, was present and presented R. W. Bro. Marden with the Joseph Warren Distinguished Service Medal of the Grand Lodge of MA for the tremendous work he has done on behalf of Hesperia Lodge, Milton Lodge, and the Craft as a whole. When one is cognizant of the oratorical abilities of the recipient, it is amusing to find that R. W. Bro. Marden was actually speechless for once. Joseph R. Zottoli, DDGM, District 4 (Roxbury), 1951, 1952; Hesperia; missing SN?